NEOSSat orbiting above Canada (Credits: University of Calgary). Canada’s first space telescope NEOSSat (Near-Earth Object Space Surveillance Satellite) dedicated to detecting and tracking asteroids, will be launched aboard Indian Space Research Organization’s (ISRO) Polar Satellite launch vehicle (PSLV). NEOSSat reached India on January 18, and is scheduled to launch during a window opening February 11. NEOSSat will not just be first Canadian space telescope, but also the world’s first space telescope designed to detect and track asteroids as well as satellites. “This is the first space-based asteroid-searching telescope, period. Why shouldn’t Canada be the leader in a field? And it happens in this case, we are,” says Alan Hildebrand of the University of Calgary, one of two principal scientists for the satellite. 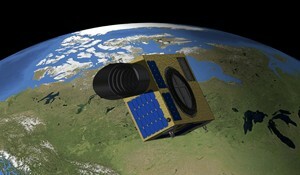 NEOSSat is jointly funded by the Canadian Space Agency (CSA) and Defence Research and Development Canada (DRDC). It will circle the globe every 100 minutes, and scan a region near the Sun to locate asteroids that may someday pass near Earth. The suitcase-sized NEOSSat weighs 65 kg and will orbit at an altitude of approximately 800 km above Earth. As the satellite will orbit at a high altitude, it is not limited by day-night cycle, and will be able to operate 24/7. Unlike ground based telescopes, NEOSSat doesn’t have geographic, time, or weather constraints for detecting asteroids and satellites. In its other capability, NEOSSat will monitor operating satellites as well as dead satellites and space junk, as part of DRDC’s project High Earth Orbit Surveillance System (HEOSS). It will be the first micro-satellite used for this purpose.